This comprehensive work provides a penetrating analysis of modern Middle Eastern history, from the Ottoman and Egyptian reforms, through the challenge of Western imperialism, to the impact of US foreign policies. 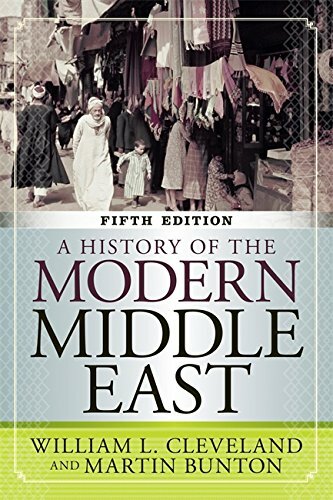 After introducing the reader to the region's history from the origins of Islam in the seventh century, A History of the Modern Middle East focuses on the past two centuries of profound and often dramatic change. Although built around a framework of political history, the book also carefully integrates social, cultural, and economic developments into a single, expertly crafted account. In updating this fifth edition of the late William Cleveland's popular introductory text, Martin Bunton provides a thorough account of the major transformative developments over the past four years, including a new chapter on the tumultuous Arab uprisings and the participation of Islamist parties in a new political order in the Middle East. This comprehensive work provides a penetrating analysis of modern Middle Eastern history, from the Ottoman and Egyptian reforms, through the challenge of Western imperialism, to the impact of US foreign policies. After introducing the reader to the region’s history from the origins of Islam in the seventh century, A History of the Modern Middle East focuses on the past two centuries of profound and often dramatic change. Although built around a framework of political history, the book also carefully integrates social, cultural, and economic developments into a single, expertly crafted account. In updating this fifth edition of the late William L. Cleveland’s popular introductory text, Martin Bunton provides a thorough account of the major transformative developments over the past four years, including a new chapter on the tumultuous Arab uprisings and the participation of Islamist parties in a new political order in the Middle East. A new test bank and lecture slides are available for adopting professors. The late William L. Cleveland was professor of history at Simon Fraser University, Burnaby, Vancouver, British Columbia. Martin Bunton is an associate professor of history at the University of Victoria, British Columbia. He is the editor of Land Legislation in Mandate Palestine.